Marketed as "a party game for horrible people", Cards Against Humanity is not a game for the terribly PC, or a game I will ever play with my parents - the thought of explaining some of these cards makes me physically ill. The rules are simple: a black card is drawn, & everyone plays a white card from their hand of 10 to answer. The most appropriate (usually the funniest) card wins, & that player gains the black card as an Awesome Point. Whoever has the most Awesome Points at the end of the game wins. There are House Rules I am still bitter about: An extra white card is submitted every round, belonging to an imaginary player named Rando Cardrissian. If Rando wins the game, "all players go home in a state of everlasting shame". I can't completely despise him because of his amazing name, but damnit if Rando didn't beat me. A completely random drawing of cards gave me this potential outcome. You can get Cards Against Humanity from the official website in 2 ways: order a physical copy for $25, or you can download the PDF, print & cut the cards yourself, & play right away. We had them printed for $6 by a very nice printer lady we know, & while she probably thinks very poorly of us now & will never make eye contact again, $6! The other fun thing I did this week was attend an online concert from my home office. Stageit is a site that offers "a front row seat to a backstage experience". Broadcasting live, online concerts, it's a much more interactive experience than watching YouTube videos. A streaming forum next to the video screen makes it easy for the performer & audience to connect with each other. As a fan, you buy a ticket (most are under $5), can directly tip the artist, request songs, ask questions...it is very cool, & truly a new way to share your talent or attend (not just watch) a show. Read about my first experience with Stageit via a Glen Phillips show here. I felt like I was sitting cross-legged on his California lawn while he played for everyone, & everyone had a front row seat. There are some bands that bring you right back to the age you were when you first heard them. Blur is one of those bands for me. There was a time in high school when I may have existed inside a BritPop bubble. My 6-disc CD player held a rotation of British bands like Pulp, Menswear, The Charlatans, Manic Street Preacher, Elastica, Cast, Suede...but none of those bands got as much play as Blur. They had such a progressive pop feel: unique guitar sounds, odd song structures, & observational lyrics that made you feel like you were in London with them. They were also 4 cute boys. In 1997, I went into a Blur concert in love with Daman Albarn & came out in love with Graham Coxon. 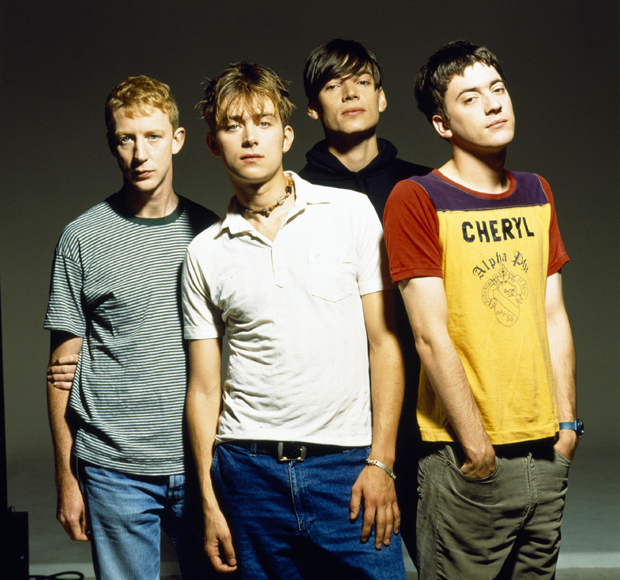 Something about that nerdy-looking boy playing the guitar, the musical mastermind behind Blur's original sound. Adorable, & so very British. How I wished my name was Cheryl. I got caught in a Blur YouTube spiral after that, & was pleasantly surprised at the amount of Graham Coxon solo material. He has released 8 solo albums & YouTube is full of performance videos, including this treasure, "In The Morning". The guitar is mesmerizing in this Beatles-esque beauty. I had read that Blur would be performing for the last time together for the Closing Ceremonies of The Olympics, & they did...but in Hyde Park, with none of it televised. It was a sad "Sunday Sunday" for me. By tonight, the audio from the concert will be available on iTunes. Next week, a 3CD set will be released with bonus live tracks. November brings my Christmas present: a DVD/CD set of the concert, plus extra bonus tracks, plus a 60 page hardcover. Yes, please. Watching the videos already uploaded from last night's concert, Blur sounds & looks as great as always. Their last live song, "The Universal", reduced me to tears from the first notes, & it didn't help when Damon blinked back tears of his own. "Just let them go." Note that Graham walks offstage carrying what looks like a cup of tea, so he remains the most adorable ever. High school Lisa has resumed Graham-crushing. This has been posted on my facebook feed by at least a dozen friends, but I had avoided watching it because I can't stand the song. I'm glad I finally gave in, because Steve Kardynal video-bombing random people is hilarious. I still think Chatroulette is creepy, & all the shirtless guys reaffirm the high douche factor...but it really is nice to see how many people were quick to have fun with it after the "WTF" moment passes.